And the cop will not go to jail. This is what has sparked protests by thousands in St. Louis from September 15 through today (September 21). In 2011, St. Louis cop Jason Stockley fired 5-7 shots at Anthony Lamar Smith, killing him. Stockley claimed that Smith was selling drugs and chased him at high speed and shot him to defend himself. The story was briefly reported as another drug deal gone bad, and it was just incidental that the cop was white and the victim was black. When Stockley first approached Smith’s car, he carried his own AK-47, an unauthorized weapon, as well as his police gun. Was it possible that Smith sped away because he was terrified of the cop and not because he was selling drugs? Stockley received a 30 day suspension for carrying the AK-47 and resigned from the police force in 2013. He moved to Houston TX to take a lucrative management job. After a wrongful death suit brought on behalf of Smith’s young daughter resulted in $900,000 damages the City’s prosecuting attorney found new evidence and charged the former cop with murder in 2016. A device from inside the police car recorded Stockley telling his partner, “I’m gonna kill that ******!” as they chased Smith at over 80 miles per hour through the streets of St. Louis. Additionally, a video showed that after Stockley killed Smith, he went back to the police car, grabbed an object and placed it by the victim. The prosecuting attorney charged that Stockley had planted a .38-caliber revolver so he could falsely claim “self-defense.” Tests showed that the gun had DNA from Stockley but not from Smith. The prosecutor also pointed out that it would make no sense for an officer who had killed a suspect to handle the evidence, since they are trained not to. Judge Wilson waited almost a month to announce his decision. The verdict would come out only a few miles from Ferguson MO, where white cop Darren Wilson killed an unarmed black man, Michael Brown in 2014. During the month, the media reviewed evidence against Stockley and observed that, with the charge of first degree murder, he could be the first white cop ever to receive a death sentence for murdering a black man. But they also said he could be given a sentence of life in prison, or be convicted of second degree murder. As a side note, they stuck in the potential decision of “not guilty” as if it needed to be included as a theoretical possibility. But, in the days immediately before the September 15 announcement of the verdict the tune of TV news stories changed. Now they featured the new Missouri Governor Eric Greitens (a Donald Trump Republican) and the new St. Louis City Mayor Lyda Krewson (a Hillary Clinton Democrat) calling for “calm” when the verdict was announced. It was clear that both had been told what the verdict would be and that the Democratic and Republican bosses were closing ranks against black St. Louis. The two had unique election histories and distinct political styles. In his 2016 campaign for Governor, Greitens gained national infamy for his TV ads with automatic weapons hinting at eagerness to shoot opponents of his ultra-right agenda. In her 2017 campaign for Mayor, Krewson won notoriety for her promise to shut down New Life Evangelistic Center, the only full service homeless shelter in St. Louis that served a predominantly black population in a spiffy white downtown loft district. Running against five black candidates who divided the votes of their community, Krewson won the Democratic nomination early in the year with only 32% approval. 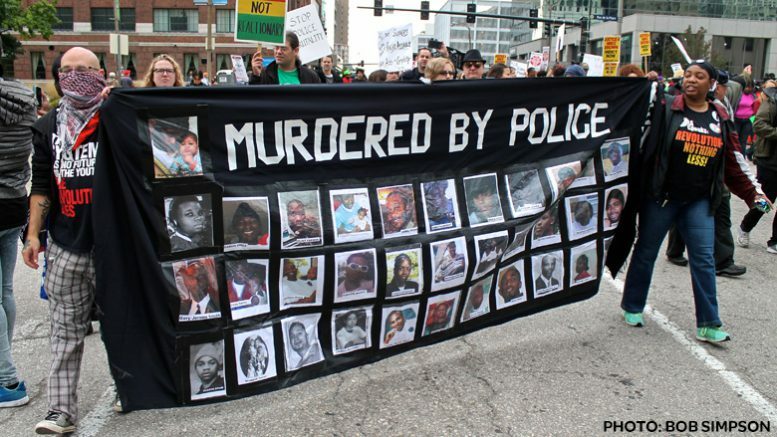 The atmosphere in Missouri toward white cops killing black men is probably not unlike AnyState, USA. 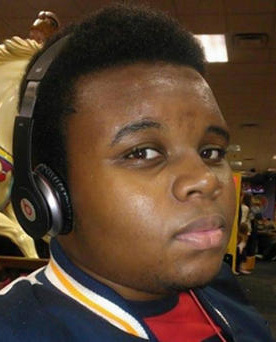 On the first anniversary of Michael Brown’s death, a group of police in Columbia MO announced it was having “Darren Wilson Day“ in order to celebrate that cop’s killing the unarmed teenager. Then, as St. Louisans waited for the verdict on Jason Stockley, they witnessed another bit of local color. 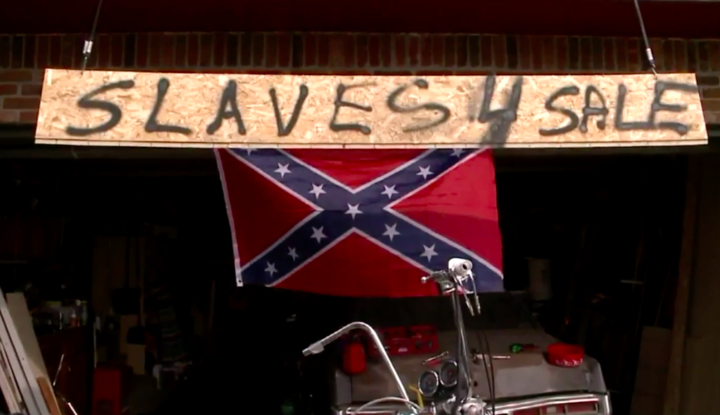 Richard Geisenheyner felt hurt by his neighbors’ complaining about the confederate flag in the front of his house. So, he hung a sign by the flag saying “SLAVES 4 SALE.” The Liberty Plaza MO man claimed he did it because he was “tired of the government telling him what to think.” Unsurprisingly, corporate media was unable to make any connection between this attitude and repeated killings of blacks by white cops. Two days later, on September 15, the verdict was announced and the entire progressive community was stunned. 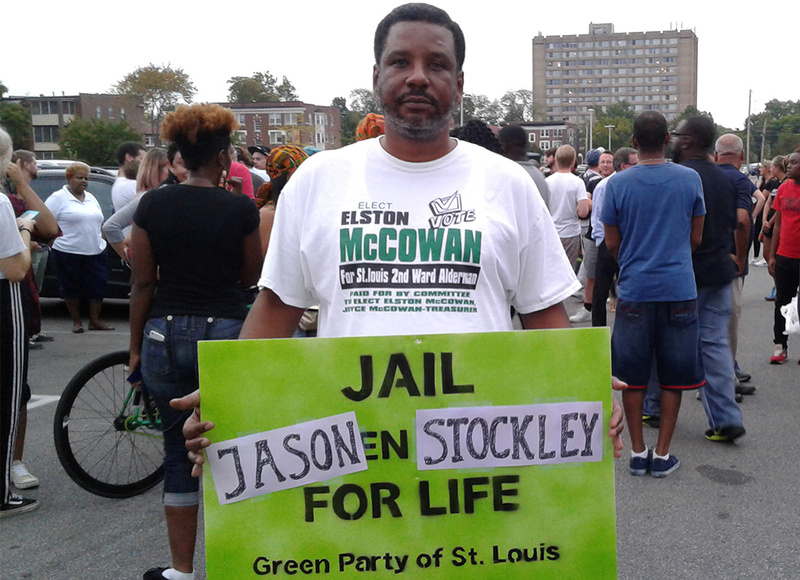 Jason Stockley would not get the death penalty. He would not get life imprisonment. He would not get 30 or 20 or 10 years imprisonment. He would not even do one day in jail. Judge Wilson decreed that he was innocent and set him free. Free to make buckets of money writing memoirs of the agony he claimed to feel. Free to become a cause célèbre of the Ku Klux Klan. When exoneration of the killer cop hit the air, within minutes Zaki Baruti, leader of the Universal African Peoples Organization and Green Party candidate for governor in 2000, had pulled together nine people to protest by the courthouse. Within a few hours, the crowd of demonstrators mushroomed to hundreds. Everyone who participated had their own thoughts about what happened. My mind went back three years, to when the St. Louis County Grand Jury decided not to indict Darren Wilson for the murder of Micheal Brown. Wilson went on the air giving the line that got him off the hook. He explained that when he saw Michael Brown, “He looked like a demon.” Apparently, since Brown looked demonic, St. Louis County Prosecutor Bob McCulloch decided to withhold evidence from the Grand Jury, which probably had something to do with the failure to indict Wilson. I flashed back to high school when I heard that Nation of Islam speakers referred to “white devils.” Not one person on the planet is stupid enough to believe that a black man could kill a white cop and walk free because he imagined that the cop was a demon or devil. But for a white cop killing a black man, that hallucination is reality. The verdict of Stockley’s “innocence” fell like a ton of brick because, as some level, everyone knew what it meant: If he could not be convicted of any crime, the judge’s decision said that no white cop should ever be convicted of killing a black man, regardless of the evidence against him. The verdict proclaimed that Donald Trump’s maelstrom is upon us. St. Louis police were pulled from many regular duties and announced that they were unable to provide security for weekend events which were canceled across the city. Investors moaned the loss of revenue from cancellation of concerts such as the rock band U2 and singer Ed Sheeran. Dozens of schools let students out early on Friday, September 15. By Monday, students had walked out of class in at least 3 high schools and 2 universities. In addition to street demonstrations, hundreds marched through shopping malls. There have been so many spontaneous marches that no one knows for sure how many people have participated – several thousand for certain by Wednesday, September 20. A funny thing happened at Central Reform Congregation (CRC) on Friday night. Feeling threatened by police as they marched from Kingshighway and Pershing, demonstrators asked for sanctuary at CRC, which they received. According to eyewitness John Chasnoff, police promised not to attack them if they got off the street. After things quieted down and demonstrators tried to leave CRC to go home, police pepper sprayed them, forcing them back inside. Then the police showed the media where CRC had red paint splattered on it, and, TV did as prompted and reported that demonstrators had vandalized CRC. But why would anyone vandalize a synagogue that gave them sanctuary? It does not add up. The pieces only fall into place if it was a police provocateur who did the damage. The pieces only fall into place if it was a police provocateur who did the damage. 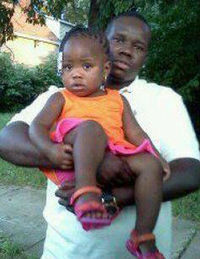 Another incident revealed cops’ giving non-verbal threats of their willingness to cause severe bodily injury or death. The Riverfront Times reported that at 7:30 pm on September 17, a cop “driving an unmarked patrol car put the blue Impala in reverse and shot through an approaching crowd, narrowly missing protesters who scrambled out the way.” As everyone is acutely aware of the August 21 murder of an anti-racist by a white supremacist racing his car into a crowd in Charlottesville VA, the police action in St. Louis was a not-so-subtle reminder of what the boys in blue can get away with. Press gives scant attention to police hostility as it focuses almost exclusively on windows being broken in downtown St. Louis the night of the verdict and the Delmar Loop the following night. That happened at the same time as several members of the Green Party of St. Louis held an emergency meeting at my house, just off the Delmar Loop. We could hear the constant humming of police helicopters overhead. Buses with windows darkened so you could not tell if they were filled with National Guard troops or were empty to cram in protesters passed in front of and behind the house as Greens discussed how to make the demand for justice central part of Rev. Elston McCowan’s campaign for Alderperson of Ward 2. The position in the 95% black Ward is open because Alderperson Dionne Flowers vacated it to become a flunky in Lyda Krewson’s new city government. The press statement ended by asking for an independent investigation of police responses to the Stockley acquittal and stated that a refusal of the Mayor to do so would indicate her participation in a cover up of police violence. Why did Judge Wilson set off a bomb by exonerating Stockley? One passage of his 30-page decision stands out. In the critical issue of Stockley’s throwing the gun into the car, the judge said he had to believe the cop’s claim that it was already there because “A heroin dealer without a gun would be an anomaly.” This was despite the report that the friend who had just been riding with victim Anthony Smith reported that Smith did not have any heroin or a gun. What does the judge’s decision mean? It means that a Klansman who is worried that he might not get away with lynching can become a cop. When he has an urge to kill a black man, he can chase him down a city street at 80 miles per hour, smash into his car, point a gun at him and fire it several times, go back to the cop car to get heroin and a gun, throw them on the body without even bothering to wipe his fingerprints off, and get ready for a press interview where he feigns remorse over a killing which was “unfortunately necessary.” Then he walks away scot free. Don Fitz is on the Editorial Board of Green Social Thought, which is sent to members of the Green Party USA. He produces the show Green Time in conjunction with KNLC-TV. He was the 2016 candidate of the Missouri Green Party for Governor.